On the 6th of May, 1954, Roger Bannister broke the 4 minute mile, his time was 3:59. Everyone said it was unthinkable, that his heart would explode. But he did not listen. His feat is known as the ‘Dream Mile’. Amazingly enough, 4 weeks later, an Australian named John Landy broke it too. What had been deemed impossible now had become an accepted possibility. Do you dream of becoming a successful trader? Do you have those around you who say ‘TRADER? YOU want to be a trader?!! Ha Ha Ha Ha!’ Those words alone should drive you to want to prove them wrong! We are not given dreams without the power to make them come true. Dreams are in the mind of the believer and the hands of the doer. If you believe you can do it, you can do it. If you are not making the money you dreamed of, perhaps you are locked into a destructive mindset. To be successful you have to take responsibility. You cannot dream yourself into the position of a successful currency trader. You must work your way into it. You must take on the responsibility of this destination and truly believe you can achieve it. The things we believe deep in our souls always seem to come to pass because that belief is so strong that it places us in a position to do WHATEVER it takes to achieve that goal. Successful traders will do what failing unsuccessful traders cannot and won’t do. You don’t need to improve your skill. Once you have found a sound methodology which is proven to work over time, like price action, the only thing holding you back are your emotions. And you have to upgrade your self-concept. Trading is 10% skill, 90% psychology. The journey successful traders take ends up a very different one from the one they started out on. They develop a self-awareness of who they really are. Learning to become a successful trader is probably one of the best therapies around because you learn about mental blocks and the psychological limitations which stand in your way. For the negative attributes such as impatience, impulsivity and lack of self-control which make our daily lives difficult, will destroy you in the market. Trading can be a never-ending nightmare as people invest blindly in the financial markets, only to find that this is the longest journey they have ever undertaken in their lives. But learning to trade successfully can be one of the most life-changing events we experience. Essential are an open mind, honesty, commitment and humility. Humility is the crown of the noble who constantly remain humble in order to learn what they need to learn for the benefit of their own lives and the lives of others. And above all, you must have persistence. Giving up is not an alternative. And so many traders give up just before they were about to achieve success. The financial markets force you to be fair and honest and to make your word equal your deed. One of the main problems in society is that we are all busy telling ourselves things that are not true, and the things we are not willing to do. And yet we say we are willing to do them. Life is not about our promises, it is about our actions. Are you are the type of person who just says whatever needs to be said, just because it has to be said and often to get others off your back and leave you to do what you wanted to do or not do in the first place? When we get in the habit of saying things with no meaning and we carry that habit to the trading table, we have a tendency to act before we think, and when you act before you think, especially in the forex market, you are going to land yourself in trouble. Hence it is critical that you create your own Constitution which is written and which lies on your trading table next to you at all times. Successful forex traders and successful people in life, live by what they believe in, not what they feel. They are constitutionally based, not feeling based. Unsuccessful people and traders are feeling-based versus constitutionally-based. 1. The most important benefit is that it starts to build your character. In our lives we must control our thoughts as they become our words and we must control our words as they become our actions, and we must control our actions as they become our habits and our habits become our character. This is so important because our character ultimately becomes our destiny. If you always do what you have done, you will always get what you have got, and if you always get what you have got, you will always have what you currently have. The only way your life is going to change is if you have the courage to make that discipline change. Change starts when someone first sees and then takes the first step and part of taking that first step involves a paradigm shift. A paradigm shift is when a dramatic change in thinking and planning occurs, one which ultimately changes the way projects are implemented. 2. Countries like the United States have a Constitution. It provides the foundation of rules of behaviour and values. 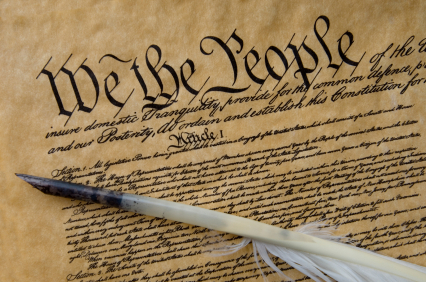 A personal Constitution provides us with a purpose for what we are doing. Why are you here? Why did you get up this morning? Why do you trade? The reason we trade is to make a profit. But the greatest benefit of learning to trade successfully is that it forces you to completely change your personality. It forces you to purge yourself of a whole lot of bad habits that were standing in the way of your personal success in life and in your relationships. You have to change those to become a successful trader. 3. It forces us to create a set of rules for our own safety. Those rules create the necessary boundaries of our performance. 4. It forces us to be disciplined to those rules. Discipline is where success comes from. 5. Being committed to our Constitution gives us security and stability. For instance, in my relationships it allows me to be bullet-proof when I do all the right things. I already know what pushes my partner’s buttons and so I choose to do the things that does not push those buttons and in that I become bullet-proof. Thus adherence to our Constitution gives us the stability and security that we are doing the right thing and this keeps us out of trouble. 6. Discipline to those rules changes our personality and usually for the better. 7. Commitment to a personal Constitution is a continuous reminder of our rules, our values and of our character and what we need to do to maintain our character. 8. It becomes the policing force in our lives. 9. it reduces stress and increases relaxation as we trade. For example, today we are in retracement mode and so this is a time NOT to enter the market. What’s Really Stopping You From Trading For A Living ? THANKS Mr. Nial! Delightful article!! Super! Your lessons are wonderful. I am so confident that I will be a successful trader. I am once again floored at the depth of your knowledge. I believe that anyone who stumbles upon your website, like I did when I decided to look for honesty on the web with regard to forex trading, will not wish to leave you again. Your lessons are truly dynamite and apt to awaken any live person to this great opportunity of prosperity and independent living as a successful forex trader. Thank you so very much for your guidance. great work, i’m so happy to have found this site that you can not imagine. Deeply enjoable,these words can stright up many backs. Hei man. That is an excellent article. Yu r not only a forex mentor but u r slowly becoming a life mentor to your followers. So much for a young guy like you. Paragraph one is truly a corner stone whatever life direction or purpose taken. The depth of information is realized by few people but it is a joyous journey. Good material, good read, Good to do. thank you very much for this one special articel under a lot. One of mine sound views is: To find solves for problems is easier when the problems aren’t your ones. You Nial, you know the traders problems to became successfull and show them the solves. Nial: Thank you for all your sharing of incisive and valuable information. It is ironic that the key to financial success is the key to personal growth and vice-versa. In tune with the Tao. So glad I found your videos on youtube last year. Thank you so much for the article I recieved this morning. I’ve been through a very difficult time with the trading and was ready to giveup, this e-mail was special to me and it contained a very important positve message in that Roger Banister’s breakthrough of the dream mile was made possible because of his determination and the person who came second that evening was my father. So for me this message was a very personal one in that it felt as if my father used this medium to encourage me to not give up with my trading dream. Nial, you are wise beyond your years. This journey into the world of Forex trading has and will continue to reveal my character. I must take courage and action to change the things that keep me doing the same old things and getting the same old results. Thanks. Nial: I was surprised when I saw the interview video, you are a very young man. What is more surprising is the wisdom you are showing us in the articles you are posting. After reading the first article, I find that I am at a place where words fail me. There is not enough time, or space in this comment section, to say all that I feel. As a poor substitute I will say “Well Done”. Well done and I think that Pt. 1&2 are the best writtings that have come from you up to date, full stop! As an experienced Trader it resonates 110% within the core of my soul. I love in Pt. 2 when you begin to say “We move from managing our poverty, which is….”. It explains beautifully the ethos of what you are communicating. Implicit in what you say is the idea that becoming a trader is to venture into the unknown, become an entrepreneur and by default a businessman. Unless this is understood and accepted then it is doubtful you will succeed. Adding to the excellent comments above, it maybe worthwhile enrolling in a small business course and see what is needed to become successful. Of course there are areas which will not apply e.g. advertising, prospecting etc. but there is an equivalent area in trading and if you cant see this then maybe you should consider doing more research, looking for a coach or not becoming a trader. In my very limited experience, my observation is people who succeed in trading quickly are those who either are in business or have been in business. They know to be successful takes careful planning, understanding what you are getting in to and the need to risk a little money but preserve capital. How can I say this? That’s because I have been in business and was not very successful. Its the reflection I now bring to trading which is going to help me become successful. For various reasons I am seeing a psychologist as I need to address issues in my past as they have been holding me back. By the way if anyone decides to take the psychologist route, hunt around until you find one who suits you as psychologists have their speciality and their knowing needs to match to your needs. I tried four before finding one who suits me at this point in time. I may change again if my goal changes and this psychologist doesn’t have the knowing I need. Learning to trade has been the most intensive self development course I have ever undertaken and I am becoming a better person into the bargain.